it’s better to have loved and lost. – this luminous life. May 16, 2012 May 18, 2012 ~ Laura N.
You’ve probably lost a pet before. I lost a fish, a couple snails, a baby mouse, and three frogs. Recently, my family’s dog passed away at the age of thirteen, while resting on the floor. I miss her a lot; however, since I had not lived with my parents for a couple years and she was pretty old, it didn’t hit me terribly hard. One of the things that is hard about having a pet is the inevitability that it will eventually die and leave you heartbroken. Avoidance of that pain may be a reason that people do not want to become attached to pets. Pets require a lot of care and love; then one day, they’re gone. It’s hard. The same thing applies to people. Sometimes it’s scary to build up a relationship with someone because they may leave. Yet, our lives are so much fuller when we have these positive relationships with people. Which sounds better to you: a life of avoidance and loneliness, or a life with positive relationships that come and go, yet build your character? As cliche as it sounds, it really is better to have loved and lost than not at all. Thumper, thank you for reminding me that loving and caring for an animal that needs a home is better than not loving at all. 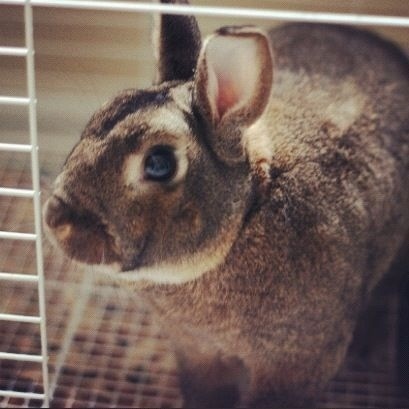 You were a great, happy, adventurous bunny. We all need to live our lives with a spirit of adventure and happiness. Adopted: February 6, 2010. Goodbye: May 15, 2012. Next ›Little Things: Cuddly Cats & Swing Sets. I’m so sorry for your loss! Rabbits are really the most joyous pets…most people don’t realize how special they really are. My bunny of 7 years passed away about 3 years ago. I still miss her! My husband offered to get me another one, but you know, each animal really has its own personality and character – another bunny would just not be the same as my little Reesie. We still haven’t gotten a new pet, and I’m ok with that. We will, one day, when we’re ready, and you will, too! I’m sorry to hear your beloved bunny passed away too, but thank you for sharing that with me. You are so right, though — another pet can never replace the one you had (just like people can’t be replaced). We do have another rabbit (we had two), but it’s still not the same for me. I’m just glad that we had Thumper in our lives than never at all!